EPF SMS Number for PF Balance Checking and SMS Format for EPF Balance Check by SMS Facility complete details…. The Employees’ Provident Fund Organisation of India has provided another facility to check your PF Balance using mobile phone, this is another method then EPF Balance Check by Missed Call, in this facility you have able to check your PF balance and knowing of final statement by sending an SMS from your registered mobile phone. 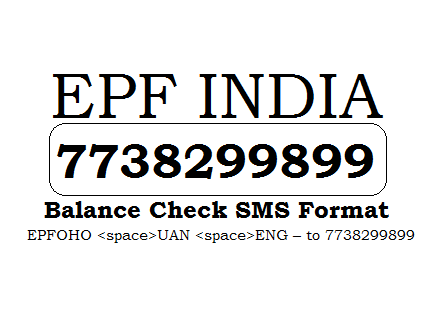 All the EPF India members who have activated their Universal Account Number (UAN) they can know latest PF contribution and balance available with EPFO by sending an SMS by using the service, this is also a simple way to check EPF Account Balance Passbook in your regional (local) Language. The EPF India has announced the guidance about using SMS based service, we have also provided some simple steps to using the facility with SMS format to download EPF Account Statement in your local language, and the facility is available in 10 languages viz. English (default), Hindi, Punjabi, Gujarati, Marathi, Kannada, Telugu, Tamil, Malayalam and Bengali. All the EPFO members can send an SMS as per above format they will get reply with complete details of EPF account holder name, DOB, Last contribution and total balance available in the PF account. In above SMS format, the EPFOHO indicate Employees’ Provident Fund Organisation head office. Next ENG is indicated your preferred language is English, you have entered TEL you have requested to know your PF Balance in Telugu Language. First 3 letters of regional language is the short code, we have listed the language short codes to send an SMS to get EPF Statement in your regional language. Actually, Employee Provident Fund EPF is acting as a money saving instrument for all government employers, an employer can contribute equal amount towards savings that can be availed upon employee switching jobs or after retirement, lot of retired employees are depending on PF and Pension. This is because employee can get their PF amount at the time of retirement, and PF is the main advantage in our country, all you know that PF is an investment scheme towards your retirement of an employee. and now you check EPF balance via SMS, by giving a missed call, via the EPFO app, and the EPFO portal, follow the below processes to check EPF Balance with / without UAN Number Passbook. Every employee can check by visiting official website of Employees’ Provident Fund Organisation, not only for balance checking but also you can download passbook online or withdrawal funds by using UAN, below we given step by step procedure to check easily. first of all open the EPF India Official website of http://www.epfindia.gov.in/. Then Go to FOR EMPLOYEES under tab OUR SERVICES as shown in below picture. after the above step now make a click on MEMBER PASSBOOK under SERVICES column. Then a page will be open asking your UAN Number and Password. Then Enter your UAN Number followed by password, After EPF Login in into your EPF account you can access your EPF account. That’s it on next page you will see a message download your passbook and check balance. There are many ways to check EPF balance without UAN some are listed below. By Giving a Missed Call. In this process you have to sent SMS to 7738299899 from your registered mobile number. Then you receive SMS containing your EPF balance. the SMS format is like EPFPHO UAN ENG. Last three letters represents language of the received SMS. so it’s yours up to choice what language will you choose. You can receive PF balance details by missed calling through UAN registered mobile number to the number 011-229014016, if you didn’t receive message just try again. Download UMANG App from play store or open given URL and download it https://web.umang.gov.in/web/#/ . After download the app form play store, login into the app with UAN Number followed by its secure password and then check your Pf Account balance online.